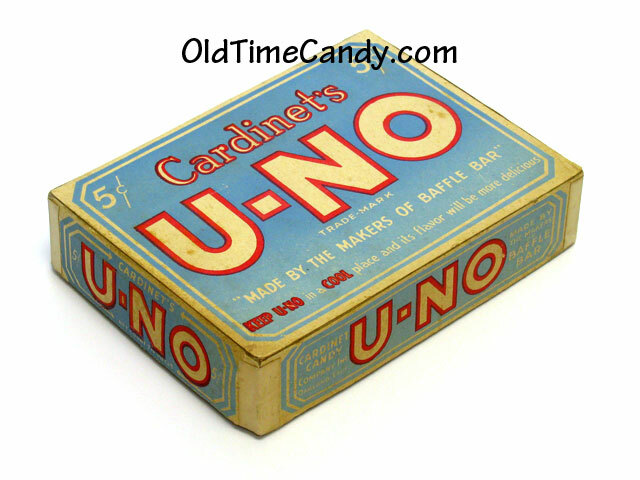 The U-No candy bar was first produced by the Cardinet Candy Company in the 1920s. Annabelle Candy Company acquired Cardinet and the U-No brand in 1978. We have been unable to discover the origins of this candy bar's name. Do you know? When my best friend, Florence, and I attended the 2nd and 3rd grades at Sunnyside School Elementary school in San Francisco, California, only five houses separated our homes, and we spent most of our time together when we were not at school or asleep. Our favorite activities were skating and riding our bikes, but our most important decisions revolved around how we would spend our candy money. What a dilemma! Other candy bars cost five cents. U-No candy bars were smaller and cost ten cents. But they were "oh so special." A discussion always took place each time we walked to the grocery store, but the decision was always the same -- U-No! In our friend's garage was a loft, where we stashed our U-No bars, Fleers bubble gum and comic books. Evidently, a stranger learned of our stash, and one day robbed us of our treasures. We were devastated, and we mourned our losses, but most of all we wished we had not saved our U-No bars for later long-anticipated enjoyment.